Paris Saint Germain and Marseille are not happy with Canal Plus. 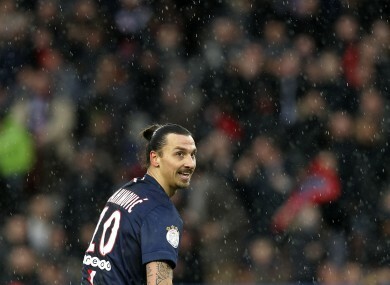 Canal Plus pictures showed Swedish star Ibrahimovic in an expletive-laden rant against referees and France. Both were punished for tirades aimed at referees which were shown by Canal Plus. As a reprisal, PSG and Marseille say they will not answer the station’s questions after games or at press conferences until the end of the season. Paris coach Laurent Blanc rejected a question from Canal Plus after Saturday’s League Cup final win over Bastia. The channel attended Blanc’s press conference Tuesday ahead of PSG’s Champions League quarter final clash against Barcelona, but it did not try to ask a question. French international Payet was banned for two matches for shouting at the referees room that Marseille had been “screwed” after a goal was disallowed in their 0-0 draw with title rivals Lyon. Again it was shown by the subscription broadcaster which, with BeIn Sport, has the rights to show French league games. Canal Plus deputy director general Maxime Saada told AFP that the channel had become a “hostage” between the clubs and league disciplinary judges because of film taken around the Ligue 1 matches. But Lyon coach Hubert Fournier said television channels should not be “falsely accused” for the actions of players. “From the moment you accept them (TV cameras) in these mixed zones, it is for the actors to be conscious of their comments and actions to avoid this kind of scandal,” said Fournier. The French government’s Secretary of State for Sport Thierry Braillard said he was “profoundly surprised and disappointed” at the decision of Paris and Marseille. Email “Top French football clubs boycott TV channel over incriminating film”. Feedback on “Top French football clubs boycott TV channel over incriminating film”.